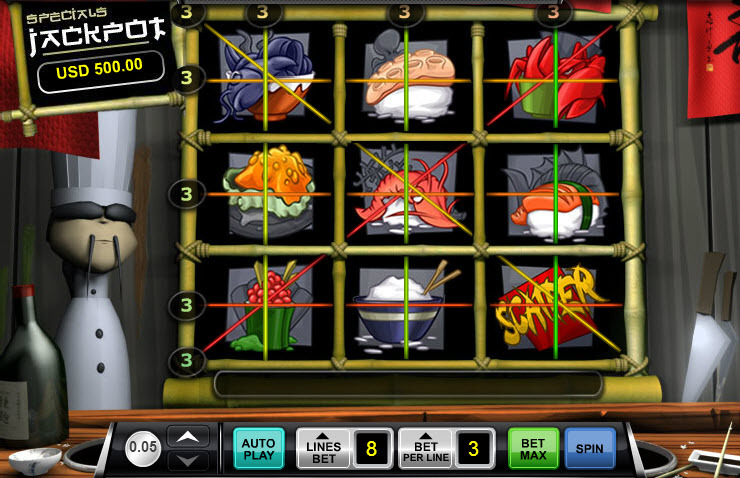 Overview: Get a taste of exotic raw delicacies with Wild Sushi, a 3-reel, 8-line slot machine. Bet 1-3 coins with denominations ranging from 0.05 to 5.0 and form winning combinations with some delectable raw seafood dishes. Line up 3 potentially poisonous blowfish in an active pay line and score 10,000. Find 3 or more Scatter symbols positioned anywhere on screen and earn big piles of credits at once. 3 scatter symbols pay 2 credits, 4 pay 5, and so on until 9 symbols pay 300. 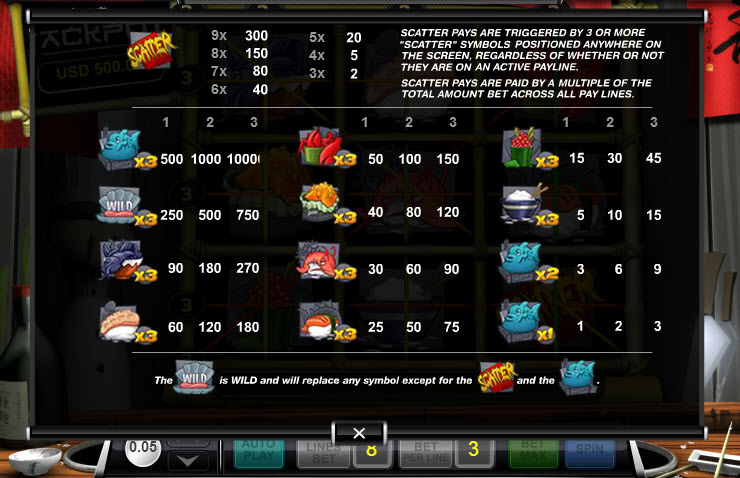 The scatter pays are to be multiplied by the total amount bet across all pay lines. Each coin value also has a separate special jackpot prize up for grabs. Play with the 0.05 coin and potentially win a 500 jackpot. The 0.25 coin has a jackpot of 2,500. The 1 coin has a 10,000 jackpot, while the 5 coin has a 50,000 jackpot. Similar Slots: If you like Wild Sushi, you might like these other slot machines from Ace Gaming: Conspiracy Slot, Cross Country Reels, Deal or Steal, Headline Slots, Heaven Cent.